The paying banker owes duty to the customer, to honor the cheque according to Customer’s mandate. The Negotiable Instruments Act, 1881 lays down the law relating to payment of a customer’s cheque by a banker. A banker is called paying banker who holds the account of the drawer of cheque and makes payment, if the funds of the customer are sufficient to cover the amount of cheque drawn or if overdrawing facility is given to the customer. It is known as Paying Banker. 1- To make payments of the cheque. 2- To collect money and deposit it into account. A banker can be performing the function of paying banker for one customer and collecting banker for another. The law on responsibility of paying bank is providing in the Negotiable Instrument Act, 1881.The relationship b/w the banker and the customer is just like Debtor and Creditor relationship. The banker is bound to pay the cheque drawn by the customer. The duty on the part of the banker, to honors his customer’s mandate is provide in sec31 of the Act. Sec 31 applies only to the banker. The customer has the right to ask back his money from the banker (debtor). Duty of banker to pay the sufficient fund, property, compensates the drawer, loss and damage caused by default. 8 – Dividend warrants are the main examples of Negotiable Instruments. Sec 73 (1) lays down that a cheque is a bill of exchange drawn on a banker payment on the demand. Elements of cheque:- The elements of cheque are as following. 1- Cheque must be in the form of order not request. 2- It must be in writing. 3- Cheque must be signed. Acc To sec 23- If no signature on the cheque, then the drawer would not be liable. 4- Cheque is drawn in a banker. 5- The name and the address must be shown on the face of the cheque. 6- The cheque instructed bank to pay the money on demand. 7- It is drawn for a specified person or in favour of a bearer. Rights and duties of a paying banker are specified in sec 31 of the Negotiable Instruments Act. The paying banker should verify the Date, signature, amount in words and figures. It is the main duty of the banker. It is collected in good faith and without any negligence. Protection to a paying bank is mention in sec 10, 85, 89 and 128 of the Negotiable Act 1881. For paying banker to claim protection, he has to satisfy, is provided in sec 10 of the act. 1 - U/ sec 85- The banker seeks the protection where payment has been made to holder. I.e. payment must be made in course. 2 -u/sec 89- The payment made by bank was not acc. To apparent tenor of instruct. When the customer signature on the cheque is forged there is no mandate to the bank to pay. 3- u/sec 128 – there is liability of a paying banker when customer’s signature on the cheque is forged. In joint account, if one of signature is forged then banker cannot make payment. Where the signature on a cheque is forged or placed without authority of a person whose signature is forged or unauthorized signature then banker has no right to mandate to pay. The payment cannot be regarded as Customer’s order. A manager in a company who, in his usual authority, is not entitles sign or authority the payment of cheque. In an emergency, while Director or the appropriate officer is not immediately available. This is a case of unauthorized signature not amounting to forgery. On the other hand, where a cheque issued by authorized officer of the company is proved to have been issued in order to defraud the company or employer such a cheque will be considered as forged. In case of forgery, the banker may be able to recover the money from the person to whom it made the payment. On the ground that one had been paid under a mistake of fact. But it seems that the claim may fail if it is proved that Defendant has acted honestly and has altered his position to by paying away the money in or having received the payment lawfully. U/sec 60, where a banker on whom a cheque is drawn pays it in good faith. The banker is deemed to have paid the cheque although the endorsement has been forged or made without authority. A drew a cheque in favour of B. but A’s clerk forged the endorsement and negotiated the cheque to H who look it benefited and for value .The cheque was paid by A’s bank in good faith and in ordinary course of business. It has held that the bank was not liable. There are two conditions for the protection of banker. 1 – The banker must have acted in good faith in paying the cheque. The Plaintiff was money changer in Paris. He received a circular from the defendants containing a list of stolen bank. Bank of England notes with their serial number. Afterwards he changed a stolen note, which appeared upon his circular but he negligently failed to refer to circular before doing so. The Jury found that there had been no dishonestly on his part. It was held that he was entitled to recover as a bonafied holder of the note in question. 2 – The payment made must be in ordinary course of business. Where defendants paid in cash a crossed cheque drawn on them by the Plaintiff. 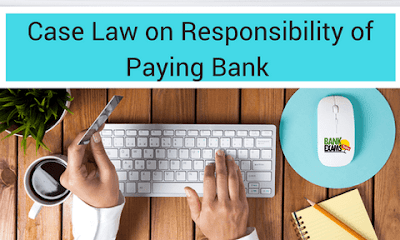 It was held that this amounted to negligence on their part and that they are not entitled to debit the Plaintiff’s account with amount paid out. 1 – Both crossed and uncrossed cheque. 2 – It does not apply where the drawer’s signature is forged. 4 – Applies only to cheque payable to order. U/sec 76, there is protection to banker in cases of Non Endorsement and irregular endorsement in cheque. 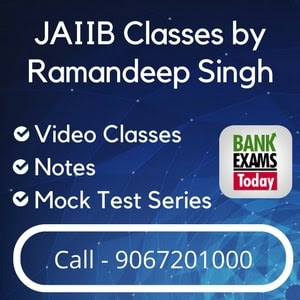 A banker who pays a cheque drawn on him in good faith and in ordinary course of business does not incur liability by reason only the absence of irregularity endorsement and he is deemed to have paid in due course. In this case, The Defendant alleged that he paid the sum to Plaintiff by a cheque and need for proper endorsement. There was no signature and cheque was stamped paid. The cashier who purportedly paid it was not called to give evidence and at back of cheque read ‘Mrs. Theresa Agbafe S.A 18 Akpata Street, New Layout. The court held that the name and the address at back of cheque were not signature and it could not be protected under the Bills of Exchange Act. If a cheque presented to a banker for payment had been fraudulently altered and alteration is apparent. The banker will be fault if cheque is paid by him. Where the banker cannot debit the customer’s account with anything more than the original amount on the cheque. Since the customer is not negligent. In this case, the court clearly states the legal position that where there were forgeries which were not due to a customer’s negligence. It is the duty of the banker to credit the amount of such a customer whose cheque has been forged. But the banker may be able to recover from the forger the amount paid to him in an action for money had received. Later on it may be liable for criminal prosecution by the state.